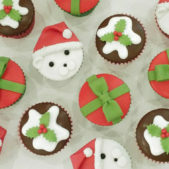 Spread the festive cheer with some Christmas cupcakes from Cakes by Robin. Ideal for Christmas parties, seasonal get togethers, corporate events as well as tasty gifts. Browse the gallery for inspiration. Make the seasonal period even more festive with some perfectly designed Christmas cupcakes. Created in a compact size so that you can enjoy them throughout the festive period, our Christmas cupcakes are great to have at the Christmas party, corporate event or just at home. 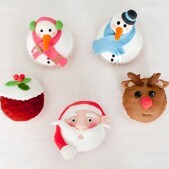 Adults and children alike will enjoy our Christmas cupcakes. 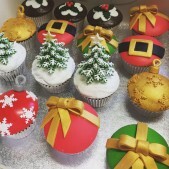 We can deliver Christmas cupcakes to any location in and around London or you are welcome to collect your cakes from our cake studio in south west London.